The Persian Wars: Marathon (490 B.C.) - The Greco-Persian conflict at the beginning of the 5th century B.C. was a defining event in the ancient world. Until then, the Persian Empire had been an unstoppable force that crushed every opponent in its path. Having conquered Asia Minor, Mesopotamia, Egypt and Bactria, no land seemed capable of withstanding the onslaught. In 513 B.C., Darius turned his attention to Europe and planned to bring its eastern edges under his control. This was prompted by his desire to subdue the Scythians who for decades had been raiding Persian territory (see Scythians on Persian timeline). It was an important expedition in that the kingdoms north of Greece, Thrace and Macedon submitted to Persian power. In addition, many of the Greek isles in the Aegean also submitted. Of course, colonial Greeks on the west coast of Asia Minor had been part of the Persian Empire since the conquest of Lydia. And in that time they had by and large lived peacefully under Persian rule. All of that changed in 499 with the Ionian Revolt. As with the rest of the Persian conflict, Herodotus is our primary source for this revolt. It began in the city of Miletus and spread to the other Greek colonies. The Greeks in Asia Minor knew their only hope was to receive assistance from the mainland, so they sent envoys to Greece to appeal for help. Athens as the mother city-state of Miletus, sent 20 ships to aid the revolt (Eretria added five). Despite this, Persia crushed the revolt and exacted the heaviest toll on Miletus as the instigator. But Darius wasn't satisfied. He intended to make an example of Athens and Eretria for their support. There is a famous story in Herodotus that up until the invasion of Greece, Darius had a slave tell him every night at dinner, "Sire, remember the Athenians." In 490, he launched his campaign, under the command of Artaphernes, his nephew, and Datis, a Median noble. Herodotus puts the number at 600 ships (the total number of soldiers is not known, but was probably at least 25,000 and not more than 50,000). Their orders were to enslave Athens and Eretria and return their citizens in chains to Darius himself. Eretria was attacked first and fell after a week long assault. In accordance with Darius' orders, the city temples were pillaged and burned, and the citizens enslaved. The fleet then sailed south, with Athens being its next target. It landed on the north side of Attica at a plain called Marathon. The Persian soldiers disembarked and prepared to march on the city. But, to their surprise, they saw that the Athenians had not waited for Persians to come to them; they had come to the Persians. Athens mustered a force of about 10,000 hoplites and they were joined by another thousand or so Plataeans. In addition to Persia's foot soldiers, they also brought about a thousand cavalry, but they lagged behind the infantry. The Greeks, under the command of Callimachus and Miltiades, seized the opportunity and attacked. Despite their inferior numbers, the hoplites were more disciplined and more heavily armed and routed the Persian army. The Persians beat a hasty retreat back to their ships and many more were killed in the process. Herodotus puts the number of Persian dead at 6.400 while only 203 Greeks (192 Athenians and 11 Plataeans) were lost. There are two famous stories from the aftermath of the battle. The legendary run of the soldier, Pheidippides, from Marathon back to Athens in full armor, to report word of their great victory, who, upon delivering it, collapsed and died. He covered a distance of 26 miles, which is the origin of the modern-day marathon run. And the arrival of 2,000 Spartan soldiers at Marathon the next day, whom Athens had appealed to for help. Sparta promised to send aid, but had to wait until after the passing of the full moon in observance of a religious law. They did send help, but it arrived too late to participate. Upon seeing the dead Persians scattered on the field, they congratulated the Athenians and returned home. King Darius was now seething with anger and vowed to raise the greatest army the world had ever seen to guarantee a victory in Greece. But a revolt sprung up in Egypt preventing him from mounting an immediate invasion, and he died in 486 B.C. before he could make another attempt. Thermopylae (480 B.C.) - Darius' death was not the end of Persia's attempt to punish Athens. His son, Xerxes, ascended the throne and had every intention of exacting revenge on behalf of his father. And he would not be satisfied with simply attacking Athens, he meant to conquer all of Greece as well. When he became king, his first job was to suppress uprisings in Egypt and Babylon. But by around 483 B.C., he was able to turn his attention toward Greece. This delay proved to be extremely fortunate for Athens as it gave the Athenians time to strengthen their navy after the discovery of a valuable silver mine in between the first and second invasions (See "Xerxes" below for a summary of the preparations). This space will be used for a more detailed account of the Battle of Thermopylae. Unlike the first invasion where Darius stayed home, Xerxes would lead this attack himself. His first move was to send heralds to all the Greek states, except for Athens and Sparta, for the token gifts of earth and water; a sign of submission to the Persian Empire. He did not want Athens and Sparta's submission, he wanted their destruction. The Greeks, for their part, prepared for the defense of their homeland. They chose the narrow pass at Thermopylae (which means "Hot Gates"), through which the Persians would have to march, as the spot to make their stand. The Spartan king (one of two as Sparta had a dual monarchy), Leonidas, would command the Hellenic alliance (Hellenes are what the Greeks called themselves). While off the coast, the Athenian navy waited for the Persian ships that would accompany their troops. The Greeks had about 7,000 hoplites, including 300 Spartans. The Persian army approached with two and half million infantry and cavalry, according to Herodotus (an obvious exaggeration. More likely about 200,000 max). Herodotus says the two armies made camp and waited for four days. Xerxes expected the Greeks to flee in terror at the sight of the massive Persian force. In the Greek camp, many had considered it. This is when the most famous quote of the battle was uttered by the Spartan, Dieneces. 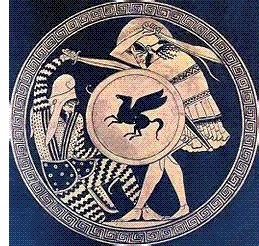 Historical lore attributes the verbal exchange to be between him and a Persian envoy, but the record says it took place between the Spartan and another Greek soldier during this calm before the storm. The precise quote is as follows: "...one man is said to have distinguished himself above all the rest, to wit, Dieneces the Spartan. A speech which he made before the Greeks engaged the Medes, remains on record. One of the Trachinians told him, 'such was the number of the barbarians, that when they shot forth their arrows the sun would be darkened by their multitude.' Dienecies, not at all frightened at these words, but making light of the Median numbers, answered, 'Our Trachinian friend brings us excellent tidings. If the Medes darkened the sun, we shall have our fight in the shade.'" (Herodotus 7:226). When the Greeks did not run, Xerxes could no longer afford to wait, as supplying an army that size was a monumental task. The Persians approached and gave their opponents one last chance to surrender. A herald bid the Greeks to drop their weapons. Leonidas' response was, "Μολών Λαβέ" (Molon Labe, "Come and take them!"). Infuriated, Xerxes gave the order to attack. The Greeks had chosen their location wisely, as the narrowness of the pass created a bottleneck which neutralized Persia's superior numbers. In addition, the defenders were more heavily armed and better disciplined. Xerxes threw as many soldiers at them as possible, which was like tossing meat into a grinder. The Greeks cut them down with minimal losses. Leonidas had enough hoplites in reserve to rotate them back and forth on the front line in order to keep them fresh. Frustrated, Xerxes ordered his his men to withdraw and sent in his 10,000 "Immortals". These were his elite soldiers who were so-named because when one fell, he was immediately replaced by another. Xerxes best troops fared no better. At the end of the day, he ordered them to back off. The next morning, expecting the Greeks to be wounded and worn out, Xerxes threw another wave at them. Once again, they were hopelessly outmatched. Once again, they had to back off. Xerxes, whom Herodotus says lept from his thrown on several occasions during the battle in fear for his army, was now perplexed about what to do. But it was on the third day that he received the answer from a Greek traitor. A Trachinian named Ephialtes. He showed the Persian king a second pass around Thermopylae that would take his army behind the Greek line. Leonidas was well aware of this pass and posted a thousand Phocians there to guard it. When the Greeks learned the Persians discovered it, Leonidas ordered all the troops to withdraw except for his Spartans. However, the Thespians insisted on remaining as well. Probably a thousand men total stayed, buying time for the rest to retreat. With the Persians now able to flank them, they were killed to the last man. But their heroic stand remains one of the most famous and compelling stories in the history of mankind. It's estimated that the Persians lost about 20,000 soldiers, whereas the Greeks lost about 2,000; a ten to one ratio. And the name Ephialtes became synonymous with the word "nightmare" in Greek. Salamis (480 B.C.) - The Battle of Salamis was a struggle of life and death for the Athenians. After Thermopylae, the allied army fell back to the Isthmus of Corinth, the narrowest choke-point leading to the Peloponnesus. Athens, their intended target, was exposed and there was nothing to keep the Persian army from marching on the city. While Thermopylae was playing out, the Greek navy, under the command of Themistocles engaged the Persian fleet off the coast, in the Artemesium Straight. Like Thermopylae, the Artemesium Straight narrowed, reducing Persia's numerical advantage. But Greece's strategy at sea was dependent upon its success on land, and when Thermopylae was lost, Themistocles ordered the fleet to withdraw to Salamis. Persia had supported her army with some 1,207 triremes and 3,000 penteconters (although these could be used for combat, their main function was to carry supplies and men), but storms and rough seas took about 600 vessels before they even reached the straight. Herodotus remarks, "Heaven so contriving, in order that the Persian fleet might not greatly exceed the Greek, but be brought nearly to its level" (Heordotus 8:13). Both sides lost about the same number of ships at Artemesium, but since Greece had fewer of them, it could not afford to exchange losses. So the fleet sailed back to Athens. How the Athenians would defend their city is the result of one of the most famous oracles in history given at Delphi (along with the one given to Croesus. See Cyrus the Great). The oracle said that "a wooden wall alone" would remain unsacked. After much debate, the Athenians interpreted this to mean that only their ships could save them. So they emptied their city (except for a small contingent which took refuge on the Acropolis) and waited on the island of Salamis, surrounded by their navy, for Persia to arrive. When Xerxes reached Athens he found it deserted, except, of course, for the Acropolis. He killed the garrison fortified on the hill and burned the temples. Shortly after, the rest of the population was discovered on Salamis behind their "wall" of ships. Xerxes, determined to defeat the Athenians once and for all, sailed his navy into the gulf to engage the Greek fleet. The Greek coalition consisted of 378 triremes, 180 of which were Athenian. The Persian king brought his throne along and set it upon Mt. Aegaleo overlooking the straights so he could watch his fleet destroy the Greeks. He was astonished at what transpired. The more maneuverable Greek ships had a distinct advantage in the tight quarters. The superior Persian numbers became a liability and the Greeks cut their ships to pieces. The one bright spot for Persia was the Carian Queen Artemisa, who commanded five ships. She was responsible for sinking up to nine. Her success caused Xerxes to exclaim, "My men have behaved like women and my women like men!" But it was not enough. In his eagerness for a swift victory, Xerxes made a tactical error in fighting the Greeks on their terms. When it was over, Persia had lost 200 ships, and Greece 40. The enormous loss of ships over the course of the campaign now became a problem for Xerxes. His ability to support and supply his army was greatly diminished. He made the decision to retreat back to Asia Minor with the bulk of his forces and leave a pared down version on Greek soil. Plataea (479 B.C.) - Despite retreating, Xerxes was still confident of victory, swayed by his general, Mardonius. After the loss at Salamis, Persia could no longer support such a large army. But they reasoned that the damage already inflicted on Greece would lead to its capitulation. Xerxes left a sizable army under the command of Mardonius to complete the conquest. What they apparently underestimated was the confidence the Greeks were gaining from their battles with Persia. While Mardonius retreated to Boeotia for the winter, the Hellenic alliance was assembling its largest army of the war. About 60,000 troops from 24 city-states, almost matching the number of Persian soldiers (although Herodotus puts the Persian army at 300,000 - a certain exaggeration). However, the Persians still had about 2,000 cavalry and the Greeks had none. And because of this Mardonius hoped to draw their opponents out onto the flat lands surrounding the town of Plataea. The Greeks, under the command of the Spartan, Pausanias, had stationed themselves in the foothills of Mt Cithaeron, outside the city. This resulted in a stand-off for up to ten days. So Mardonius tried to force them out by sending his cavalry behind Greek lines to cut off their supplies. Pausanias responded in kind by trying to disrupt Persian supply lines. The Persians appear to have been more successful in that the Greeks grew desperate about their situation and retreated. But when the Persians pursued, expecting to cut down their enemy, the Greeks suddenly turned back and attacked. In the melee, Mardonius was killed. The loss of their leader created confusion among the Persian ranks, and their cohesion quickly fell apart. Knowing the battle was lost, most of them fled back to camp and barricaded themselves as best they could. The Greeks broke through the defenses and annihilated the Persians. When it was over, the Greeks had lost about 10,000 men, but only around 3,000 Persians are thought to have survived and made it back to Asia Minor. That was the last the Persian army ever set foot on the Greek mainland. Mycale (479 B.C.) - After Plataea, the Greeks went on offense. They knew the Persian navy had been battered at Salamis and could not have rebuilt within a year's time. So they set sail for Asia Minor and caught up with the fleet at Mycale, directly across from the island of Samos. Persian soldiers were in no mood to engage the Greeks and built a rampart on the beach for defense. Leotychides, the Greek commander, decided to land anyway. While doing so, they spread word about the allied victory at Plataea with the intent of boosting morale among the Ionian Greeks and demoralizing the Persian troops. The Persians, for their part, liked their chances on land much more than at sea. So they broke camp and marched out to meet the Greeks. Estimated numbers put the Hellenic army at about 40,000 and the Persian at close to 60,000. Herodotus says the Greeks divided into two wings, the Athenians and Corinthians marched along the shore near the water, and the Spartans were further inland. The Persians dug in and waited. According to the account, the Athenian wing reached the enemy first and engaged, as the Spartans were hindered by rough terrain. 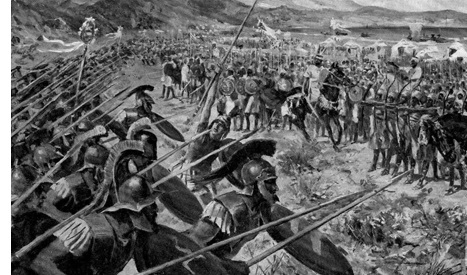 The Persian line held initially, but when the Athenians saw the Lacedaemonians (Greek word for Spartans) approaching, they fought more fiercely so they could take credit for the victory without Spartan support. The line broke and, as at Plataea, the Persian commander, Tigranes, was killed. The barbarians (which is what the Greeks called the Persians) retreated back to their palisade. But then the Spartan wing arrived, flanked the camp and completed the rout. Greek losses were heavy, perhaps a third of their troops, but the Persians lost as many as 40,000 and the remainder fled all the way back to Sardis. Although skirmishes continued for years, the Battle of Mycale effectively ended the the Persian Wars and, while the Greeks continually had to be aware of their Persian neighbor, the vast empire was never a threat to the tiny peninsula again. The bad news was that this allowed the Greeks to go back to fighting each other.